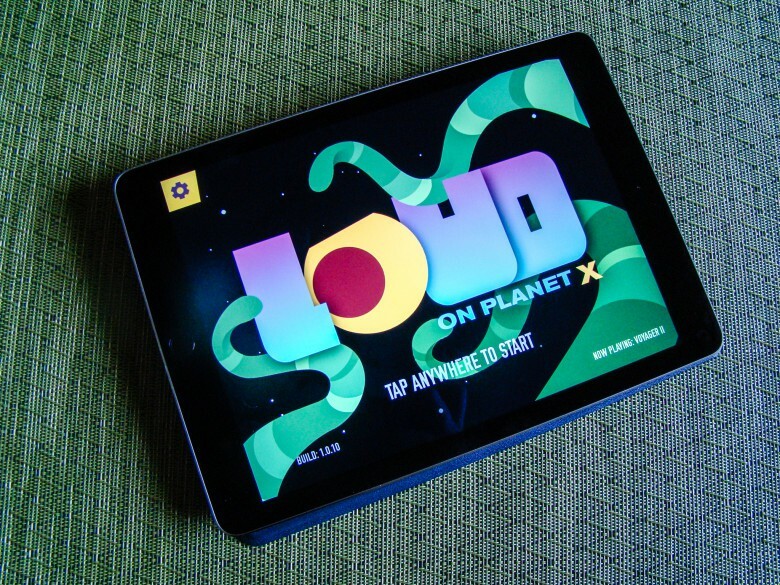 It’s Loud on Planet X! Can you get much cooler than that? I think not. You’ll get a total of 28 fantastically indie songs to play through, two from each band, along with variously clever aliens to smite with your rhythmic attacks. You’ll want to slap on some headphones for this one to fully immerse yourself in the flashing lights, teeming hordes, and indie bands up on stage. 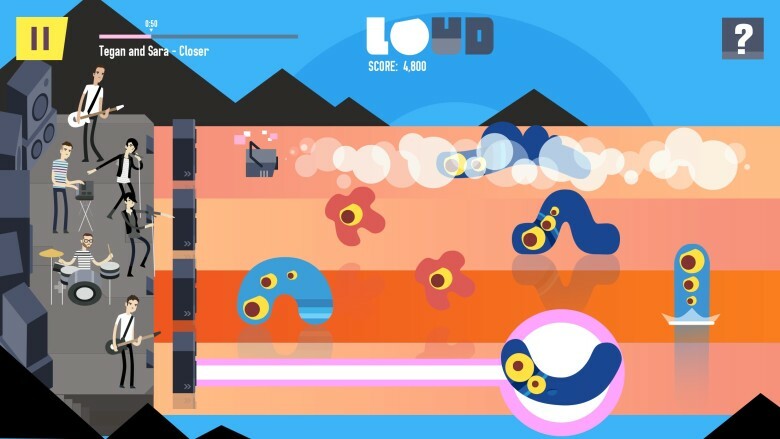 Power-ups include smoke and flashing light machines to slow the aliens down in their inexorable fight toward the front of the stage, as well as pulsing laser beams and extra speakers that take longer to smash through. You’ll defend the front speakers from aliens with as many eyes as it will take to destroy them. Hit a four-eyed blob of an alien four times to take them down, while a single-eyed monster only needs one hit. Blast and smoke out those bad guys. Build up enough on-beat taps to gain score multipliers and fill your LOUD button, which will eliminate an entire venue full of baddies. There are occasions when I get off track with the beat of a given song. Luckily, there are visual cues to help me get back into it: the speakers bounce in time with the music, as does the pink frame around the entire screen. The song choices are absolutely stellar, though not every track is a complete winner. If you can’t find a favorite in the list of indie bands lending their sound to Loud on Planet X (METZ, F*cked Up, HEALTH, Austra, Shad, Cadence Weapon, July Talk, and Monomyth), you might come away with a few more after a couple of repetitions of these catchy tunes. Better yet, you’ll only ever need to drop $3.99 on this game — no in-app purchases or other tomfoolery to keep the money flowing. Loud on Planet X is a fantastic way to spend your time and money, especially if you’re into music and want to enjoy it while shooting aliens. Head on over to the iTunes App Store and get yourself a copy of this great game today. Read Cult of Mac’s reviews policy.